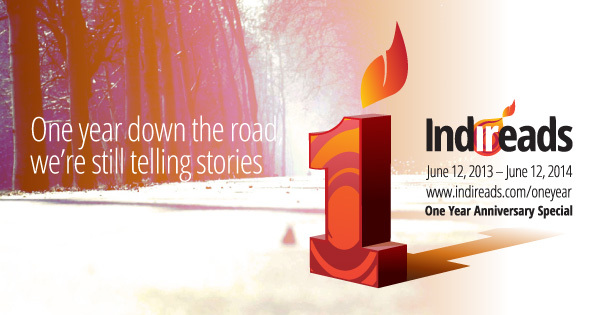 Indireads turns one today. This statement doesn’t seem very momentous, or earth shattering, but for me it is both. June 12th, 2013, a year ago today, we launched the Indireads website, bringing over 18 months’ worth of hard work to fruition and publishing 30 books simultaneously (that has got to be a record for a brand new publisher). I hadn’t slept in months, my house was a mess and my husband was on cooking duty—but euphoria held me up and kept me going. And then, reality set in. Book publishing is a tough business. Writers can be difficult and demanding, editing is never-ending, the world of e-books and social media is evolving by the minute and loyal readers seem to be in danger of extinction. And although there have been more times than I can count when I have asked myself ‘why am I doing this’, I did not stop. Could not stop is more like it. And the thing that kept me going and going and is simple—the sheer joy of seeing (not holding) the finished product. Someone’s story, translated into words and dialogue, edited, tightened and polished to become a book that we can all be proud of. A feeling of achievement that is unmatched. An entire year filled with high highs and low lows, accompanied by an extremely steep learning curve. Learning everything about the business, from contracts to marketing and from social media to sales. While there is too much to pack into one neat blog, I do want to share the top three things I have learned about writing, publishing and reading. Indireads came about because I felt strongly that the times were changing and that people, especially women, wanted a chance to express themselves and tell their stories—their kahaanis—for themselves and to the world. Everyone asks me how I went about finding writers and whether it was difficult. Finding writers has never been difficult for us, right from the beginning. Blogging and social media have opened the floodgates of self-expression and have swept away inhibitions. People want to tell the stories they have carried inside them and are not afraid to share them with the world. In this new world of connectivity and sharing, our stories are important, timely and deserve to be heard. And we are proud to play our part in helping people achieve their dream of becoming a writer. This plethora of people wanting to tell their stories also means an explosion of books coming out, with vanity and self-publishing, hitherto unheard of, playing an increasing role. Gone are the days of a handful of established publishers dominating the landscape. New, innovative publishing companies are coming up, offering writers new avenues. These new publishers are needed in order to serve the demand from the writer’s ranks, creating original and inventive content. Others, however, are mere facades that front the business of self-publishing and demand payment from the author, adding no value in terms of editing or vetting. It is easy to get lost in this deluge of books and it is often disheartening to be lumped together with all sorts of unscrupulous publishing firms. But throughout I have held firm to one tenet—that hard work and attention to detail will win out in the end. Time and again, readers and reviewers have come back and praised the quality of our books, the writing and meticulous editing. Quality shines through, good writing trumps bad writing every day of the week and readers will come back for more, if they like what they got the first time. And finally we come to readers—the one person all the writers and publishing houses are searching for. Where are they and what do they want? In this time-strapped world of live updates and hyper-social-connectivity, do people even have the time to read? And how do they go looking for what they want to read next. I know that readers are out there—as addicted to books as other may be to Twitter and YouTube. Looking for a good book and a satisfying read. They are, at the same time, more exacting and less critical—they will research and read reviews before buying one book, and purchase another simply because someone else has. But the bottom line is that they exist, they buy books, they read and they will come back for more. And the more they read, the more they can differentiate and the more they will hone into what they like and what resonates with them. Which, in the end, will be writing that they can resonate with, written by writers from amongst themselves. This is what I know and I believe. And so that, summed up, is my learning over this year as a new publisher on the block. Many people have told me that while South Asian literary fiction can compete with the best in the world, popular fiction, the space that Indireads occupies, is unoriginal and unexciting for the discerning reader. I know that the times are changing. Popular fiction writers from this region can and will compete with the Sidney Sheldons, the Danielle Steeles and the John Grishams of the west. We—South Asian writers, publishers and readers—are all growing, learning and competing. What will emerge from this apparent chaos are strong writers, worthy publishers and readers who will demand homegrown, quality fiction. And that is what our aim is, one year along at Indireads. Join us on the journey. Congratulations! I’m eagerly looking forward to your offerings in year number 2. Congrts. Wish you luck for your future ventures. Congratulations on you first year. May your second year bring even more success. I too believe South Asian literary fiction is the way to go!